We’d love your help. 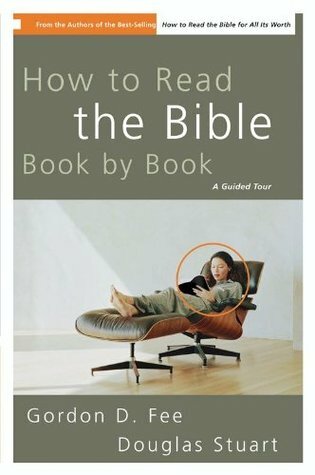 Let us know what’s wrong with this preview of How to Read the Bible Book by Book by Gordon D. Fee. Helps people read the Bible as a whole; and even when the whole is narrowed to whole books, helps readers to see how each book fits into the grand Story of the Bible. To ask other readers questions about How to Read the Bible Book by Book, please sign up. Very helpful, book-by-book, resource. Recommended. Super helpful to use as reference. And especially for those reading their Bibles for the first time. The concern of this book is to help you read the Bible as a whole, and even when the "whole" is narrowed to "whole books," it is important for you always to be aware of how each book fits into the larger story. First, this book is intended to be a companion to How to Read the Bible for All Its Worth. Anyone who has read this book will see that familiar structure of it's guided overviews of the selected biblical books there. Essentially this is an application of the concepts shared in the first book. For each book of the bible you are given the following: an overview of the themes of the book, advice for how to approach the book (what to watch for), and then a guided walk through the book itself. This tends to be less detailed than a dedicated commentary, but more than the brief introductions most bible's have in them. For me it is an opportunity to look at the bible with a fresh set of eyes, and a reminder that the bible wasn't necessarily meant to be read by the topic headings most bibles use. This is a great book for an outline of each book of the Bible and simple commentaries. It's a really great companion if you're beginning to read the Bible--the Lord really used this to help me in understanding the purpose of certain books an to help simplify it in the beginning of my walk. I've read some reviews where people said it was just a simple commentary or not in depth, but you have to remember the first time you read scriptures you didn't have a complete understanding of historical cont This is a great book for an outline of each book of the Bible and simple commentaries. It's a really great companion if you're beginning to read the Bible--the Lord really used this to help me in understanding the purpose of certain books an to help simplify it in the beginning of my walk. I've read some reviews where people said it was just a simple commentary or not in depth, but you have to remember the first time you read scriptures you didn't have a complete understanding of historical context and Jewish culture. For example how can you fully understand the message of Hebrews without being aware of Jewish religious traditions outlined in the Old Testament? This is an excellent resource to which I regularly refer. It helps me to read the Bible more profitably by pointing out key themes, relevant organizational structure, etc. While I don’t necessarily agree with every conclusion, this book serves me well and is a key tool in my Bible study arsenal. A great introduction to commentaries. A chapter for each book of the Bible, each chapter around 10 pages. A good resource for people new to Bible reading. Like any good tour guide, Fee just points out some background and context, and then mostly gets out of the way. Extremely helpful, especially with difficult prophetic portions of the Bible. Don't imagine me "recommending" this book, imagine me shaking you by the shoulders and saying, "You have to get this book! Your Bible reading NEEDS it! TRUST ME." The book begins with an overview that relates the overarching biblical themes that hold it together as a single story. In addition, prior to beginning each major section of the Bible, the authors provide an overview of the contents and interrelationships of those particular books. The reader will undoubtedly find himself disagreeing on occasion, and in any event, consulting a good commentary is never a bad idea to get both more detailed discussion and the range of views. However, by focusing on t The book begins with an overview that relates the overarching biblical themes that hold it together as a single story. In addition, prior to beginning each major section of the Bible, the authors provide an overview of the contents and interrelationships of those particular books. Fee and Stuart's follow up to their first book, How to Read the Bible for All It's Worth, is designed to help people become better readers of Scripture and build upon the process that is laid out in the first book. It provides overviews of each book, background information, etc. This book is really helpful as a resource tool and guide. For that I would have given it four stars. But, it can become a cheat sheet for those who are learning how to read the Bible. Yes, it is good and valuable to have Fee and Stuart's follow up to their first book, How to Read the Bible for All It's Worth, is designed to help people become better readers of Scripture and build upon the process that is laid out in the first book. It provides overviews of each book, background information, etc. This book is really helpful as a resource tool and guide. For that I would have given it four stars. But, it can become a cheat sheet for those who are learning how to read the Bible. Yes, it is good and valuable to have resources that survey Scripture, but I don't know how giving all the 'key' information is helpful for the novice Bible reader. This will seem knit-picky to some, but that knocked it to a three. This stands as a desk reference in my study. I use it regularly as a help in devotions (as does my wife). It is simply written and very helpful. Highly recommended to Bible students of any level. A matter-of-fact, objective summary of each book of the Bible, filled with useful information. Each chapter starts with the facts: who wrote the book, when it was probably written, main emphases and characters, and any other important information unique to each book. Then, the books are broken down by section and even verse, and with specific reading advice and summaries for each book. I highly recommend using it as a companion to Bible reading rather than reading it by itself as a book. I espec A matter-of-fact, objective summary of each book of the Bible, filled with useful information. Each chapter starts with the facts: who wrote the book, when it was probably written, main emphases and characters, and any other important information unique to each book. Then, the books are broken down by section and even verse, and with specific reading advice and summaries for each book. I especially like that it has a short glossary in the back which covers some unfamiliar words seen throughout the book (can you say eschatological? ), and that its appendix is the books of the Bible listed in chronological order for those who wish to read it so. My only criticisms are more personal rather than the fault of the authors, but I have to be honest with myself: for my personal preferences the book looks cluttered at times; there's a lot to wade through and lots of sections/subsections/subsections of those subsections, etc. Also, the commentary is a bit dry for my taste. If you are looking for a commentary that is an engaging walk through the Bible, this isn't my first recommendation. Tough to give this one a rating. I'd say 3.5 is honest, but I want to bump it up to 3.75 because I still believe it has more to offer. I was just disappointed because it didn't give what I was looking for: understanding context to better explain the crazy stuff in the old AND new testament. Technically I haven't finished this book yet, but I read it whenever I want more context on a certain chapter. It really benefited me when I was abroad and away from my usual local church. Very helpful book. It gives an overview of every book of the Bible. It has the following format: 1) Introductory material (author/date/emphases etc.) 2) Overview of the book 3) Specific advice for reading that book 4) A walk through that book (broken into sections). It's a great companion book to read before you start a new book of the Bible, especially if you are unfamiliar with it. Great book to read before reading and studying specific books of the Bible. It's not necessary to read it in order, in fact, I encourage the readers to go to this book before reading and studying a book from the Bible. We used this as a textbook for a course with Vineyard Institute - very technical in places but highly recommended! It helped us to understand the background, context, and foci of each book we studied. The point of this book is to help people understand how to read each book of the Bible. This is done by giving the context of the book, some tips or knowledge they think might help with the reading of the book, and then some general summaries of various sections of each book. By using this structure it does a pretty good job of showing how each book is unique, but also at fitting it into the larger narrative of the Bible. I'll be honest, it isn't the most enjoyable book to read cover to cover. Th The point of this book is to help people understand how to read each book of the Bible. This is done by giving the context of the book, some tips or knowledge they think might help with the reading of the book, and then some general summaries of various sections of each book. By using this structure it does a pretty good job of showing how each book is unique, but also at fitting it into the larger narrative of the Bible. I'll be honest, it isn't the most enjoyable book to read cover to cover. This seems more like an aid to read at the same time that you are studying the Scriptures on your own time. This may sound like a negative, but I'm pretty sure that this was the intention of the book so don't take it that way. Personally, I liked the book. Sure I've heard a lot of the information before in classes, but there were a few times where the insight of the book gave me something new that I hadn't heard or noticed before. One example of this was on the book of Ruth. They talked about how while in the book of Ruth the people documented follow the law of Moses well, this isn't done in some stiff manner. It doesn't display a stiff following of the law, but rather an internalization of the law that seems quite natural. I hadn't realize that before, and so often we seem to focus on Old Testament law in a very stiff and awkward way that this insight helped shift that a bit. There were other insights, but I'll leave it at that. Even though I said I liked the book, there was a question that occurred to me part way through it that I'm not sure I have a great answer for. Who is this book for? While true that this is an introduction book, this is not exactly beginners level reading. It uses theological jargon and terminology in a way that those unfamiliar may have a hard time following it. So it seems like it could be tough for some people to get into completely on their own if they are unfamiliar with some of the terminology. Sure there is a minor glossary in the back, but it isn't that big, and I don't know how much it would help. On the other end of the spectrum, someone like me who has years of education on theology and the Bible would probably rely more on commentaries or books that are more focused on specific topics or at least focused on one particular book of the Bible. While How to Read the Bible Book by Book may provide some good general insights and big picture issues we shouldn't forget, it just isn't specific enough to study a particular verse with. This would make it a tough sell to those who have more advanced needs. So who is a book like this for? That's the question that I'm not sure I have a solid answer for. In all honesty this seems to be a book produced with the introductory Bible student in mind. Someone who has enough knowledge that they want to pursue a degree in Biblical Studies or Christian Ministry, but may still have use for a book that is more introductory level. For those not in college, I'd say that this book is aimed at people who have knowledge and familiarity with theological terms, but may still need some basic framework on the flow of the Bible and how to read certain troublesome books. I recommend this book for anyone who plans on reading through the Bible. Fee does a great job giving a thoughtful overview of each section of each book of the Bible. The Bible is so varied in its various genres of literature, numerous authors, varied time periods along with the world events of each period with the Bible is often speaking about. I read through the Bible, Genesis to Revelation and went section by section with this book, checking the boxes as I completed each section. While I will p I recommend this book for anyone who plans on reading through the Bible. Fee does a great job giving a thoughtful overview of each section of each book of the Bible. The Bible is so varied in its various genres of literature, numerous authors, varied time periods along with the world events of each period with the Bible is often speaking about. I loved having this little companion to sometimes shed light on things I didn't understand and to provide background information and context to stories I'd heard before. It actually also helped keep me motivated during more difficult (boring) passages to read as I knew that at the end of the passage I'd be able to tick off a little box. Exactly what I needed. I love the “Orienting Data,” “Overview,” “Specific Advice” and "Walkthrough" format. I really appreciate Fee and Stuart's works, they get to the point immediately and you don't need to spend needless time reading through pages and pages of unnecessary information. This is an invaluable resource to add to anyone's research library and I would recommend it to anyone. I read this book alongside my Bible as I was reading through the Bible for the first time. I found it helpful particularly while reading the prophets, which I was completely unfamiliar with. If you have little or no background in Biblical history, then I would recommend this book to help interpret historical circumstances in the Bible. I've been using this book as a devotional aid for my daily Bible reading for the past year and a half. It has been quite useful and very informational, both in knowing the history and culture at the time of each Biblical book, and as a guide as what to watch for in each section. I highly recommend it, at least in this kind of use. It wouldn't be nearly as useful read by itself. This is a great resource for any serious Bible reader. It provides great context to what you are reading, which is key when reading any ancient manuscript. I do not read the Bible without this resource by my side. This book is a great one to keep right next to your Bible. It helps you to understand the different genres of the books of the Bible and enriches your reading of specific passages. It's also a follow-up to How to Read the Bible for All its Worth by the same authors. After having been thrilled with How to 1, I had a lot higher expectations of this book. I would have gone 3 stars, but admittedly, I didn't read the corresponding Biblical books as a companion as I went along. I will definitely consult it as a preaching/teaching resource though. This is one of the most helpful books ever! I come back to this book again and again in order to understand what I am reading in my bible. If I only had one book to choose to help me understand the bible, this would be the one I would pick, it's that helpful. Read this book a long time ago. Anyone who reads the Bible and wants to interpret it the way it should be and preach about it should read this book. It keeps you on the straight and narrow without diverging into several different directions that most Bible preachers and pastors now are prone to do. This is a trust-worthy resource that provides the background information needed to engage every book of the Bible. Gordon Fee is Professor Emeritus of New Testament at Regent College, where he taught for sixteen years. His teaching experience also includes serving schools in Washington, California, Kentucky, as well as Wheaton College in Illinois (five years) and Gordon-Conwell Theological Seminary in Massachusetts (twelve years). Gordon Fee is a noted New Testament scholar, having published several books and Gordon Fee is Professor Emeritus of New Testament at Regent College, where he taught for sixteen years. His teaching experience also includes serving schools in Washington, California, Kentucky, as well as Wheaton College in Illinois (five years) and Gordon-Conwell Theological Seminary in Massachusetts (twelve years). Gordon Fee is a noted New Testament scholar, having published several books and articles in his field of specialization, New Testament textual criticism. He also published a textbook on New Testament interpretation, co-authored two books for lay people on biblical interpretation, as well as scholarly-popular commentaries on 1 and 2 Timothy and Titus and on Galatians, and major commentaries on 1 Corinthians and Philippians. He is also the author of a major work on the Holy Spirit and the Person of Christ in the letters of Paul. Gordon Fee currently serves as the general editor of the New International Commentary series, as well as on the NIV revision committee that produced the TNIV. Besides his ability as a biblical scholar, he is a noted teacher and conference speaker. He has given the Staley Distinguished Christian Scholar lectures on fifteen college campuses as well as the annual NT lectures at Southwestern Baptist Seminary, North Park Seminary, the Mennonite Brethren Biblical Seminary, the Canadian Theological Seminary, Duke Divinity School, Golden Gate Baptist, Anderson School of Theology, Asbury Seminary, and Chrichton College. An ordained minister with the Assemblies of God, Gordon Fee is well known for his manifest concern for the renewal of the church.